Have you ever been bullied? Do you know what it means to be lonely? Have you ever used books as an escape from reality? Are you a member of some fandom? Or maybe you just like reading unique, emotional stories that make you turn page after page, even after your bed time? 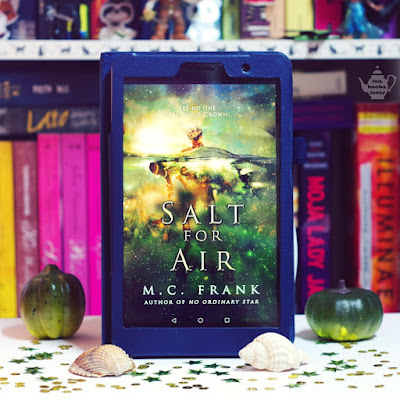 Either way, ‘Salt for Air’ by M.C. Frank is a great choice for you! M.C. Frank is one of my favourite authors of all time, so I was certain I won't be disappointed by her newest book, ‘Salt for Air’. 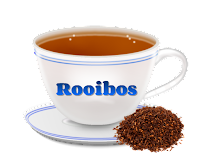 Obviously I was right - it was a delicious adventure from the beginning to the end. 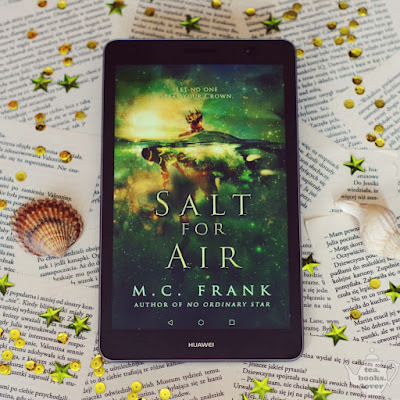 I cried, I laughed, and then cried some more, once again admiring Frank’s exquisite writing skills, the world she created and the characters she brought to life. Ellie, the protagonist, is one of those characters I’d love to be friends with, especially considering how much she needed one. She's a bookworm, she loves fanfiction, she has a Sherlock poster on her wall and she speaks fluent sarcasm - what's not to like? Her difficult life situation and the amount of pain she experienced made me feel so sorry for her and I wish I could just hug her and protect her from all hardships. The entire story is written from Ellie’s point of view and even though it's not everyone's cup of tea, I personally enjoy that kind of narration. I loved being in her head - even though it's a dark and sad place, she also has a great sense of humor and her inner dialogues made me laugh many times. With Ky, the emerald-eyed boy, I had a more complex relationship. I didn't like him too much at first, he seemed arrogant and selfish, but as he was slowly changing for the better, my attitude towards him was also changing. I think the character development is one of the strongest points in every Frank’s story, and I'm glad SFA was no exception. Ky isn't the only one who's changing as the story continues - Ellie also goes through a major development and learns a lot about herself in the process. 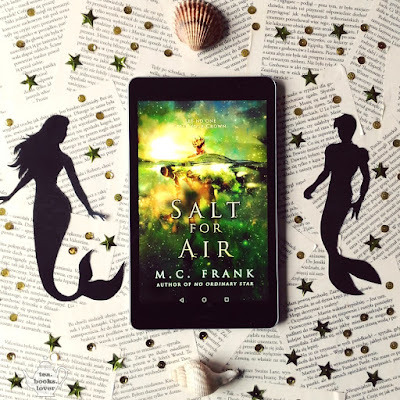 ‘Salt for Air’ is the perfect mix of a fantasy and a contemporary book. The main part of the plot is based on Greek myths, so there’s a lot of otherworldly creatures and events, but the author also puts a strong focus on real problems like bullying, dealing with grief and loneliness, and the extremely difficult situation of modern Greece. Speaking of Greece, I love that the story takes place there and the protagonist is a Greek girl, because it seems that the majority of books set in Greece is about Americans coming there on vacation, and there’s nothing about the real, everyday life in this country in them. So I'm glad I could learn a lot while reading ‘Salt for Air’. M.C. Frank has already proven that she’s not a fan of cliches and she likes to turn things around, so when you’d think there’s an overused trope appearing in the story - boom! - it turns out to be completely different than you expect, and I loved it. It would be hard to pick one favourite thing about SFA, but I know what would definitely make the top 3 - the fact that there's so much more about this book than just a fantasy story about a girl and a merman. But I won't give you any details, I think every reader needs to discover that deeper meaning by themselves. If I wanted to write everything I'd like to say about ‘Salt for Air’, it would not be a book review, but an essay. Let me just sum it up: it's a captivating, valuable read, evoking a wide range of emotions, and sending out a powerful message. It belongs to the fantasy genre, but it feels so real and relatable at the same time. I highly recommend it and I hope you let M.C. Frank take you for this magical adventure. Książki pani Frank widziałam na instagramie. Jednak chyba przez moją obawę względem języka oryginalnego nie chciałam jej przeczytać. Mam jednak nadzieje, że w końcu zostaną wydane w języku polskim bo jestem bardzo ich ciekawa.